Upholding its commitment towards down-gauging and light-weighting, India’s largest multinational flexible packaging materials and solution company Uflex Limited has launched 9.5µ speciality ALOx polyester film, FLEXALOXPROTECT™ F-PGX. 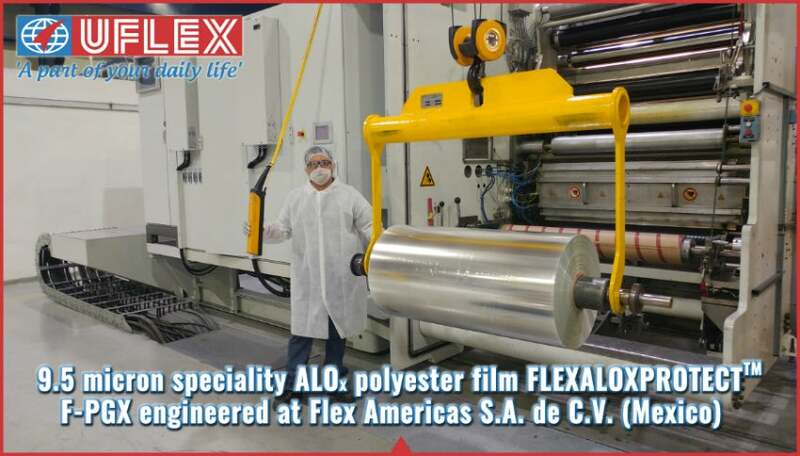 Engineered by Uflex’s fully owned subsidiary company Flex Americas S.A. de C.V at the Mexico plant, this happens to be the thinnest PET ALOx film available globally. Despite being the leanest, the 9.5µ ALOx polyester film exhibits excellent barrier for oxygen and water vapour as W.V.T.R (gm/m2/day) and O.T.R (cc/m2/day) are both < 1.0. No player other than Uflex offers such a thin PET ALOx speciality film with such superior barrier properties. There is a growing demand for transparent flexible packaging that allows retail customers to see-through and check the quality of the product packed inside to their satisfaction. Conventionally metalized films have been used to impart enhanced barrier properties to laminates, but metallization renders the film opaque. The PET ALOx film can offer yet better barrier properties while still being transparent. Being a down-gauged film FLEXALOXPROTECT™ F-PGX is 24% lighter than its 12.5µ variant and almost 60% lighter than the 23.5µ variant. Furthermore, the price coordinates are better and so is the yield. While the 12.5µ ALOx film has a yield of 57.14m²/kg and the 23.5µ film has a yield of 30.4m²/kg, the 9.5µ speciality ALOx film yields 75.18m² per kilogram. This brings major cost savings for the converters. The fact that the film is transparent and demonstrates excellent barrier properties, the need for a sandwich (barrier) layer which is typically a metallised film is completely eliminated. The PET ALOx film can be reverse printed and then laminated with a sealing substrate. Depending upon the barrier properties required by the product to be packed, ALOx coated films can be used in 2-ply structures right up-to multi-layered laminates. FLEXALOXPROTECT™ F-PGX i.e. (PET ALOx) film complies with EC and FDA regulations for food contact and finds extensive use in manufacturing laminates used for packing dried meat, fresh food, snacks, confectionery, microwavable foods, retort convenience food, cheese, baked goods, drinks, pharmaceutical and medical products. Commenting about the USPs of the speciality film, Mr JK Sharma, AGM, technical service and new product development (films) who is credited with the development of ALOx film at Uflex said: "One side of the polyester film is coated with Aluminium Oxide in a special metallizer where aluminium metal is thermally evaporated and reacted with oxygen under high vacuum conditions to achieve its oxide. The ALOx when deposited on clean film surface offers very high-barrier against oxygen and water vapour transmission simultaneously giving excellent clarity and transparency to the film." Explaining more about the new speciality film, Mr Pramod Sirsamkar president of technical and new product development (films), Uflex Limited said: "PET ALOx is a significantly down-gauged transparent barrier film which by itself is its biggest USP. Besides excellent barrier properties, the film exhibits superior ink anchorage, suitability for retort applications, imparts strength to the ensuing laminate and has optimum coefficient of friction, offering great machinability to convertors." Speaking about this new development, Mr Ashok Chaturvedi, chairman and managing director, Uflex Limited said: "We pay a lot of emphasis on Sustainable Innovation. Development of FLEXALOXPROTECT™ F-PGX is a classic example of the same. The film is down-gauged yet it offers superior barrier properties and machinability. Development of such efficient packaging films enhances the value proposition for converters, brands and the end consumers alike. It’s a win-win."